Bus from Johor Bahru to Penang is one of the cheapest transportation option to travel to Penang for well-known delicious Penang food and visiting Unesco World Heritage Site Georgetown for richly historic building structures. Why Take the bus from Johor Bahru to Penang? Though budget airlines have been servicing the market for years, the service of bus from Johor Bahru to Penang does not stop even though passengers need to travel about 10 hours by bus. One of the reasons is that the budget airline ticket is almost 2 times more expensive than bus ticket (unless you get it during a limited promotion period). Another reason is that travellers can always take the night bus from Johor Bahru to Penang. By the time you wake up in the morning, you are already in the beautiful Penang Island. Hence, travelling on the night bus from Johor Bahru to Penang saves time. KKKL, Seasons, Supernice Grassland, Kejora Masyhur, Sin Yong Express, and JB Transliner are the few coach companies providing bus from Johor Bahru to Penang. JB Transliner is actually a bus service agent who manages coaches from other bus operators. The journey duration is about 9-10 hours, as mentioned above. Coaches will have at minimum 1 and sometimes 2 washroom breaks along the journey. The bus fare is in the range of RM 65.00 – RM 100.00, which is much cheaper than budget airline ticket that usually costs around RM 120 -RM 200. It is always better to book bus tickets in advance to avoid disappointment, due to limited daily trips from Johor Bahru to Penang. The departure points for bus going to Penang in Johor Bahru are mostly at Larkin Bus Terminal for all buses. There are also additional departure points such as at Johor Jaya Bus Terminal, Tun Aminah Bus Terminal, Merlin Tower Johor and KFC Petronas Jalan Skudai. As for the arrival points, coaches will terminate at Sungai Nibong Bus Terminal. Please note that Sungai Nibong Bus Terminal is 15-20 minutes driving distance away from Georgetown. The earliest departure time is at 8:00am in the morning, while the last departure time is at 12:30am after midnight. 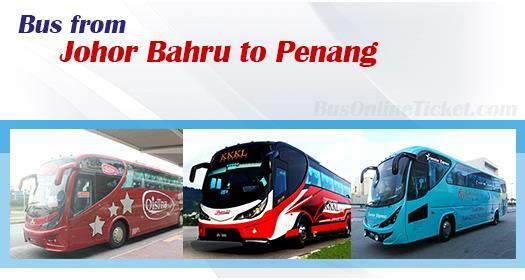 If you have your preferred choice of coach and preferred timing, it is advised to book your Johor Bahru to Penang bus ticket online in advance at BusOnlineTicket.com to avoid disappointments, especially during weekends. This is also the easiest way to get your Johor Bahru to Penang bus ticket, avoiding the queue at the terminal. It also gives you peace of mind knowing that you have everything in place before you travel.